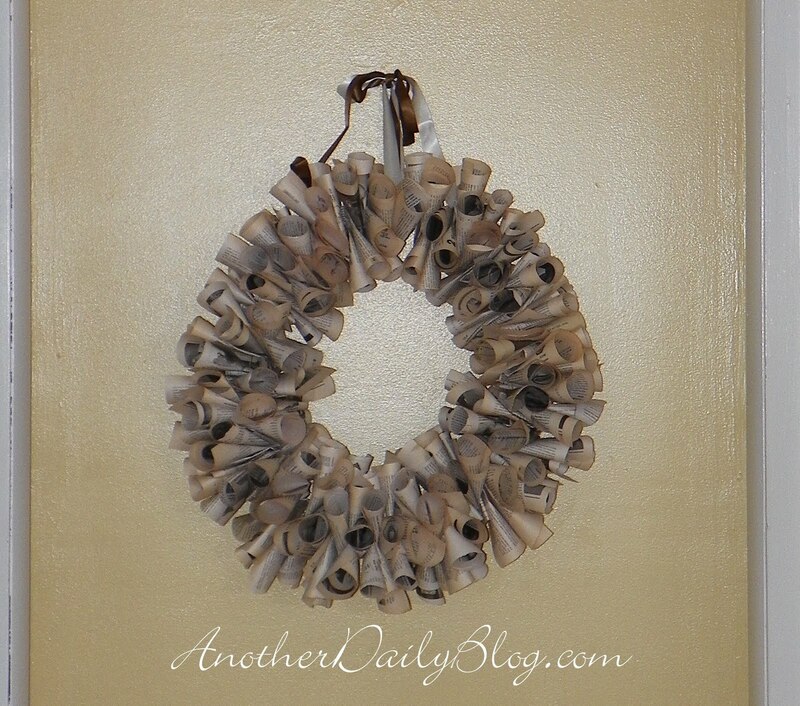 100% FREE book page wreath (Photo Tutorial to follow tomorrow).. I have been eyeing the book wreaths online for a year now. I was going to attempt one last week, but forgot to buy the foam wreath form at wal mart when I went with my daughter. (my memory is so bad these days). 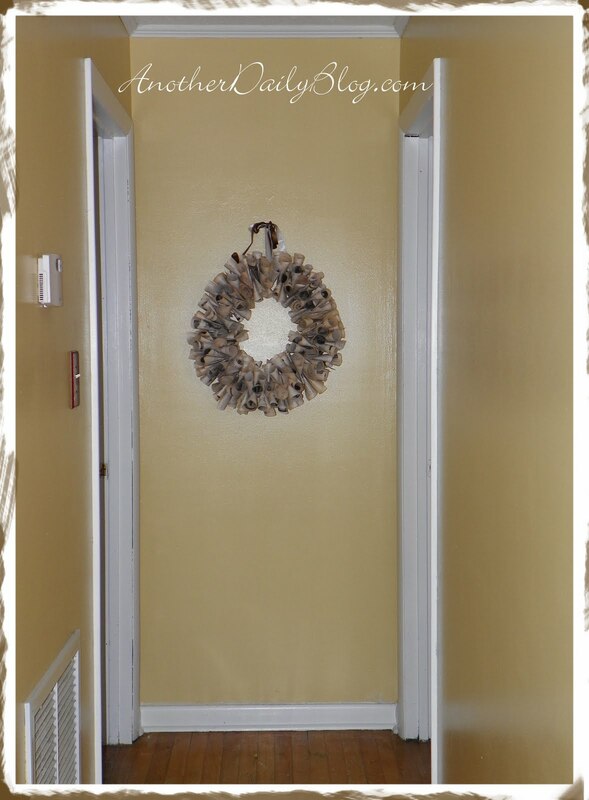 After sitting around and trying to google a way to make a book wreath with JUST a wire hanger to NO avail, I decided I can do this on my own with a little creativity. I grabbed an old wire hanger and had Doug bend it into a circle for me (they are seriously not easy to bend into a perfect circle). Once he did that I found an old car manual (my sister's ex boyfriends chevy s-10 to be exact). It was a good ten years old and the pages already had that aged yellow tint to the edges. YAY !! I started to roll the pages and punch them onto the hanger one by one. TONS of pages later I bunched them all together and then carefully folded the wire to overlap. 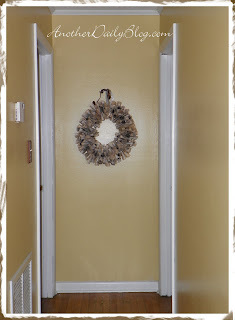 At the moment an ugly ribbon holds it up, but I will buy a thicker nicer one on my next craft store rendevous (spell?). I love it! but best off all? it's 100% F R E E !! 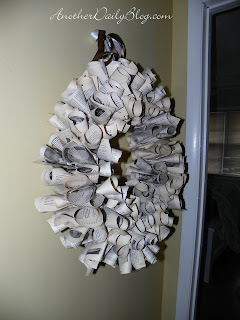 everyone has an old wire hanger and book (you can use newspaper also if need be. 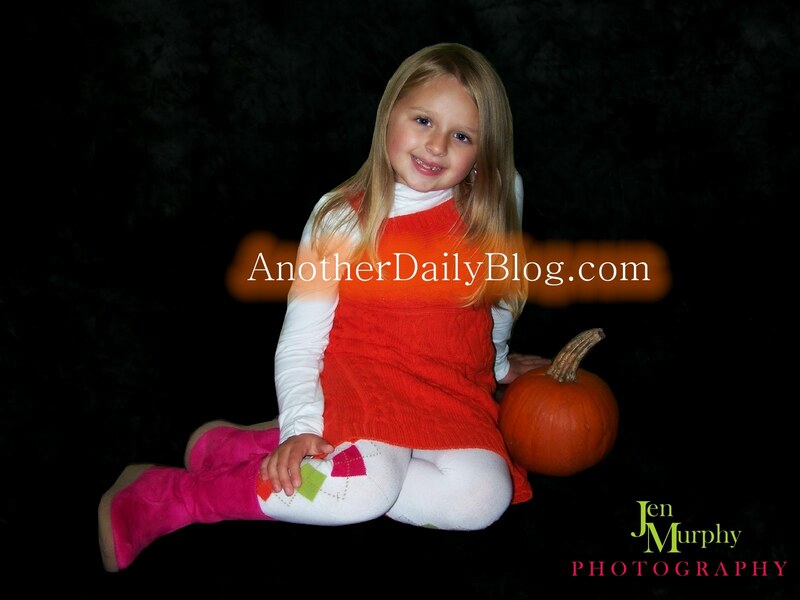 I've finally (2 days shy of Halloween) gotten the kids fall pics done. I figured it'd be too much work to do the traditional Halloween costume photo, so I just wanted some fun fall ones. My son is still not much for posing, he'd rather poke his sissy in her face or run around screaming and laughing. *haha*. But I managed a few. MiMi's outfit is all gymboree. I am far too cheap to EVER buy gymboree full price, The sweater dress I got for 13 bucks one year when it was summer and on fall clearance. The tights were on sale too - they probably weren't even for this line, but I figured they'd match and I picked them up. The boots are from the Panda Academy line, and I got them paired with the plaid Panda Academy jacket when they were marked down with a coupon for 15 each. I LOVE the colors. Ethan's outfit? the pants and shoes were from ThredUp. The old navy cable knit sweater I bought off ebay for 99 cent, and the green polo? Also ThredUp :) I love being a frugal mama! There ya go, my son in full action, being his random self. Hugging his sister - well - on her head hehe:) I love the totally random moments a camera can capture <3 I so love them!! The kids had a great Saturday. First Ethan had a much needed hair cut. Then we went to a local produce / farm to pick those mini pumpkins (in above photos). The kids each got a pony ride and then we went to Wal Mart, so I could spend some coupons. Nothing super, but Wal Mart DID have the best deals on Mr. Clean for the buy 2 get one free coupon. the 48 ounce bottles are $2.48, so two for 4.96. Then throw in the freebie and it's 3 for $4.96 :) I got two of the original gain scents (freaking heaven by the way, my house smells super, I use it on everything! counters, fridge, floors, moulding and trim, doors etc). And a fabreeze sent (not sure which). I also used the $1.50 mars candy printables to score two bags of candy bars for a buck each (hi, trick or treaters, you will love me this year!) hehe! Here's an indoor photo I took of my daughter. Sometimes indoor lighting works better. - I need to get one indoors of my son also, but he totally passed out when we went to another pumpkin patch to get larger pumpkins. Daddy decided he wanted to carve some biggun's and so...the rest was history..
Target has also had some great online deals here lately. I picked up a 5 piece lip gloss set for 99 cents (s&h included) and a squinkies gum ball set for $3.55 (s&h included). Steals!!! :) both will be used as stocking stuffers, just not sure for whom yet. My next post will have more photos from the day. As for now? I am just entirely drained & need sleep - desperately. Sleep well, loves!!! I hope your fall is going as lovely as mine!! I have been sick ALL week. I rarely get so ill that I just have no desire to do anything. I mean, of course I have two kids, which means no rest in my buns. Yep, even when I am all out sick. First it was an annoying sinus infection. Then it was a headache every day for the last 3 days. Now I just feel so worn out. EVEN after kicking my insomnia to the curb and getting a full 8 hours of sleep a night. INSANE! It hurts to breath. Mostly at night. I feel like someone is closing their fist on my wind pipe. (I am sure it has a fancier medical name but I have no clue what that is) Trachia? Spell? Maybe? I still want to get the kids to the farm to pick out a pumpkin. I still want to dress them in fall attire and do my traditional repeat Fall photo infront of the double maple trees that make my front porch view beautiful. I really need to find time to feel better and figure this out. I know what I will dress MiMi in - A orange sweater jumper dress with hot pink, orange and green argyle tights from gymboree and her hot pink boots. And Ethan? I am thinking his repeat old navy sweater I got off ebay for 99 cent:) I'll layer it with a fall shirt of some sort. I really hope he'll pose with "sissy" and get me a nice sibling photo. He is so unpredictable. I have so much to do. Doug's parents will be here for Thanksgiving:) The kids are so excited. I hope to give the front of the house a facelift of some sort. all this red on red on red in my house is disturbing. If I can atleast paint the front a little I will be a happy girl. This could be great or disasterous. Something tells me ANYTHING will look better than it does now. Seriously. The fascia boards have orange staining from the roof run off. UGH this old house is SO gorgeous inside, but from the outside you COULDN'T tell :( so sad! I will make this happen, even if it's the most ghetto quick fix until money is more available. IT will be nicer hehe. I LOVE the new Lowe's commercial!! Okay, random - I know. But, I LOVE LOVE LOVE the new Lowe's 2011 commercial!! The first thing that caught my attention was the song. Then the whole whimsical feel of it, along with the decades in transition within a family. I mean c'mon, WHO doesn't LOVE that?! As you may (or may not, but NOW know)..I am a HUGE fan of the Mad Men television series. AND I would LOVE to know who the Mad Men (ad man/woman/group) was on this commercial. I have kept myself busy with photo sessions though. I have a ton more I would like to share, but think this will do:) I hope everyone has had a fantastic weekend! !